Pearl dramatically reverses the aging process, it suspends the evidence of time. The most powerful anti-aging remedy providing a more radiant, youthful complexion and Longevity. It is the most amazing breakthrough the world has ever experienced. Go ahead, give yourself the Royal Treatment With Genuine Chinese Pearl Powder Today. Pearl is scientifically proven to clear up acne, dark spots, age spots, dry patches, rosacea, heals scaring, shrinks enlarged pores, even skin tone, and diminish lines and wrinkles, and treats other skin disorders. 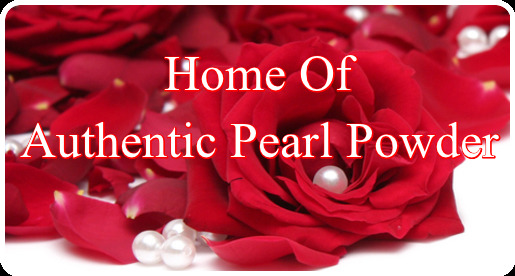 Pearl rejuvenates the skin and stave's off unwanted diseases and bone loss and maintains a healthy, strong body. Pearl powder can also be used for stomach and abdominal ailments, and as a replacement for calcium pills, which are excellent for persons with a calcium deficientiency and for osteoporosis. Not only is pearl powder significantly cheaper than calcium pills, it absorbs much more readily. Royal families of China have long been using pearl powder, and it is the reason for their beautiful, flawless complexion and youthful appearance. There are a multitude of health and skin benefits and you'll find a comprehensive list Here. 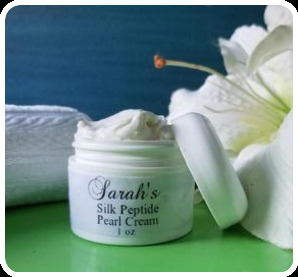 Sarah's Deep Wrinkle Pearl Cream - Lush, Luxurious And Delicious! Works Magic On Dry And Aging Skin. Pearl cream, when used every day or night, a significant reduction in blemishes, skin softening, and wrinkle reduction will be visibly noticed. Crushed pearl added to a nutritious cream is enough to eliminate the use of other moisturizing creams. The smooth, ageless skin of Chinese empresses and women of the Emperor's Court has long been the envy of women all over the world. The secret behind the pristine complexion of these exotic women was Pearl Powder. After more than 3000 years, it is still treasured. Now, you too can have the same translucent glow with Sarah's Pearl Creme, a rich, luxurious cream made from precious pearl powder. This luxury moisturizing cream contains quality hydrolyzed pearls from China and is fortified with Argirline and natural vitamin A, B, C, & E. It is easily absorbed by the skin and acts to promote clear, blemish-free skin and a healthy complexion. Sarah's Pearl Creme penetrates deeply in order to enhance skin functions. It is unlike any other anti aging facial cream on the market. Everything about it is rich, delicious and nutritious. It's the favorite of all creme's, it will be your favorite too.